You haven't heard me hum and haw over my dining room in quite sometime because I finally found my table match. Oh, and a new side table. I found them at a local antique shop. They are made out of reclaimed wood and I am smitten. My savvy smooth talking husband managed to get us both pieces for about a grand which was much cheaper than any other table that I remotely liked. 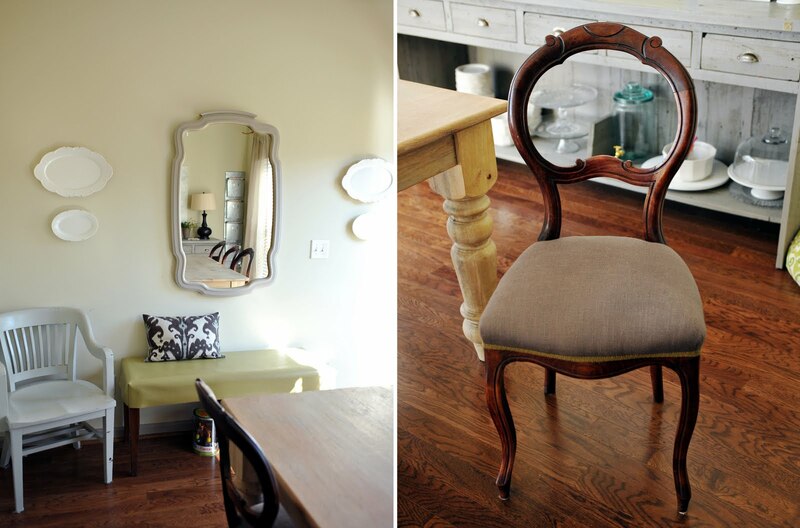 My french antique chairs are finally back from the reupholsters and I could not be any more happy. I found them as a set of six on Craigslist for $250, Ellie broke one right after I got them and the break was in such a way that was not fixable. For now one of our stools will do and KJ has already deemed it his seat so all's good. We kept the old tables bench in the room for extra seating. I slipped covered it in a Robert Allen faux leather that I bought from the Designer's Attic. I wanted something big and more modern over the sideboard to balance out the furniture so I painted a piece completely inspired (copied) from Lindsey Bond's home in this months House Beautiful. Now the only thing left is to find the perfect lighting. Right now there is a fan, I know ugh, but I hope to find a big old lantern for cheap. I think I will be hunting for awhile though and I am okay with that. If you actually read all this then I am rather impressed. Today I am in a rambling mood I guess.